Note: if you are new to this blog please read the short disclaimer in my “about” page, thanks. The excellent Grammar Rabble session on “Unsettled Marks” at Kalamazoo has me thinking about punctuation and other markers used by Christian Hebraists in Hebrew. Would elements used by scribes and authors trained in the Latinate manuscript tradition (such as Tironian notes, other common symbols and abbreviations) be imported into Hebrew texts? Would they use symbols found in traditional Hebrew writing in a different way? And as I think on this even usual use of Hebrew punctuation by Christian Hebraists is an interesting topic. And so I’m planning to seek out manuscripts containing Hebrew composed by Christians (medieval and early modern) and see what I can find. 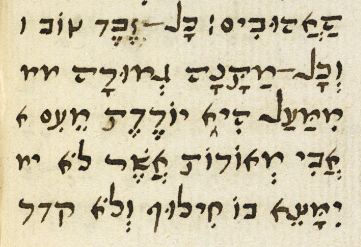 One example already comes to mind, from the 16th century translation of the Epistles to James and Jude preserved in BL MS Royal 16 A II made by John Shepreve, a Hebrew professor at Corpus Christi College, Oxford. This symbol, called an etnahta appears twenty-five times in Shepreve’s translation of the Epistle of Saint James, and six times in the shorter Epistle of Saint Jude. It is part of the set of te’amim: a series of symbols that mark the way Jewish scripture should be chanted when read as part of the liturgy. Developed by the masorites (an early medieval group of Jewish Hebrew grammarians localized in Tiberius) as part of their stabilization of the textual tradition of Jewish scripture, they are standard across the Jewish diaspora (although different Jewish communities developed different traditions about what they are called, and how they are sung). By and large they are only used for scripture, although apparently there are a few early manuscripts of the Mishna that have te’amim as well. 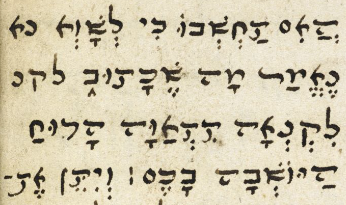 In this example, the etnahta serves to break between “it is” and “coming down”- I think because it would be possible to read the verse “…and every perfect gift from above, it is coming down from the Father of Lights”. Usually Shepreve places the etnahta below the last letter of the word, which is not its normal place in traditional Hebrew texts. This practice causes him difficulty in the following case, where he can not fit the mark beneath the elongated final final nun:ן, so he places it after in between the words. (BL MS Add. 15252 f.116v). So to conclude in this example, Shepreve “borrows” a mark used in a Jewish context for Hebrew scripture to use for his translation into Hebrew of two books from the New Testament, using it in a way that kind of resembles its original purpose, but in a way that’s different from the source. As should be clear, this is my first foray into this subject- I would love to hear from people with other examples, or thoughts about this! More examples and posts as I find them.